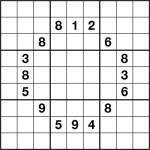 Sudoku Non-consecutive-diagonal 9×9 1 puzzleThis is a non-consecutive-diagonal sudoku puzzle. No digit may be diagonally-adjacent to a consecutive digit. But as you can see from the givens, consecutive numbers can be adjacent horizontally or vertically. What you can’t have, for example, is a 1 diagonally next to a 2 because the 1 & 2 are ‘consecutive’ (have a numeric difference of 1). This entry was posted by Gareth Moore on June 19, 2012, and is filed under Consecutive Sudoku, Sudoku Variants. Follow any responses to this post through RSS 2.0. You can leave a response or trackback from your own site. Very nice puzzle, Gareth. I had a chuckle with this one as Ikept wanting to solve it like a standard non-consecutive puzzle! Yet another way to stretch the neurons.